Tour Pictures The Moon River Brewery Company. Raining, light thunderstorms. Then humid and breezy. Crescent Moon. Susan’s Courtside Cafe was originally a home built in 1912. When purchased, several parts of the house were re-done to accommodate the restaurant aspect. For example, a mud room was knocked down and converted into the kitchen. The house originally had one bathroom, and the second one was put in. Most of the house has been maintained or moved, including; the windows are mostly original and have been moved from one place to another (if at all), the original woodwork is the same through most of the building, there is an original hutch behind the register, and some of the original cabinets have been converted into tables throughout the building. Throughout the years, there have been several major storms (including hurricane Charlie). Strangely, the buildings around Susan’s have been severely damaged, but Susan’s has continued to be spared. The glass in the windows is original. Many of the neighboring buildings have had trees fall on them, or a multitude of other things. There is an alleged suicide murder that took place in Susan’s. This has not ever been proved through historical records. Susan was able to tell us about several claims in the Cafe. 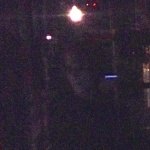 Some people have claimed to see a full apparition of a father with two children. Another allegation involves a ghost cat that inhabits the building. Our group has captured the picture of a woman in the window of the Fire room. No tales of a woman have been told. There have been tales of murder, suicide, and hangings. Physics and mediums have claimed that there is only the aura of pleasant spirits here. She has personally never seen or heard anything strange while in the building. Everyone has always told her that there are only good things from the spirits at Susan’s. Much of the building is original and redone, and a true effort to keep everything the same was exhibited throughout renovation. There are several other ‘regulars’ at Susan’s who have stronger and more frequent accounts. The building has been lucky and spared from a lot of natural disasters (specifically storms). The building has been featured on ghost tours in the past. Terry and Ceecee split into group A. Manny, Stephen, and Melissa were group B. Upon starting, Susan excused herself to the porch. The building itself is fairly small, and there were multiple tags identifying interference from another group. Also, there are no curtains up, so every window is subject to neighboring traffic. There were several police cars with their lights flaring throughout the investigation. Also, there were several trains that caused the ground to vibrate, and the horn is clearly distinctive. Group A (Terry and CeeCee) began on the porch room. Ceecee immediately entered the Gondsfield experiment for 15 minutes. She made several comments about the train, and then claimed that she felt as if something or someone was moving around her. While the room is largely wood (especially the floor), she said replication of what she had felt was not possible. Also, on camera, Terry noticed a hazing light going in and out of focus that needed to be closely looked at when going over the video footage. Group A then retreated to the Fire room. Here, several tools were used including the Ovilus and the IR thermometer. Upon asking any entities if “their heart was beating fast?”, like the Ovilus’ beating as it takes in data, the entire door to the Fire Room seemed to shift and move. There were no major temperature fluctuations, however, it is noteworthy that while the group was in here, there was a lot of humidity on the window. When the room was visited later in the night, there was no humidity on the window at all. Terry and Ceecee then went to the lounge where several additional pieces of equipment were used. First, the radiation detector. Nothing responded. The knocking test was then used. No applicable response. Then, the dowsing rods were used. No intelligent responses. The ghost box was also used, with some uncertainty. The ghost box allows entities to reach through static white noise and pull words through. AM channels were used to reduce outside interference. There was a system of reply, as every time a question was asked, there was noise on the ghost box. When no questions were asked, it seemed as if the channel would remain dormant. There seemed to be several intelligent responses to questions that were asked. Further review was necessary to determine the validity of this test. Photograph evidence collected in our multiple visits here has produced full apparitions. Our video evidence collected includes a scene where the whole room seems to shift, as if in response to a question. IR Thermometer tests have always found activity along the outside of the house, and there were some light anomalies inside the building. The spirit box session seemed to have a significant amount of interference acting as a response, and when no questions were being asked there was no active responses. There was no conclusive evidence with the dowsing rods or radiation detector. We also caught several possible mists on camera, as well as an anomaly in the Fire room where the window was fogged up for part of the night, but not during other times. – The collection of a full apparition on previous investigations. – Movement in the Fire room, in direct response to a question asked. – Godsfield experiment results, where Ceecee felt that there was movement next to here. – IR thermometer differences, while minimal on the inside, and significant on the outside. – The placement of Susan’s, with constant interference from the outside including – trains, cars, and police sirens and lights. – The size of Susan’s in relation to the 5 man team we brought to investigate it. – The inability to control the temperature and electricity. – The age of the structure.